When you first think of Hawaii, you might think of beautiful beaches and colorful aloha shirts. While you won't find a beach at the Pearl Harbor Visitor Center, you will certainly find aloha shirts. And it's not just visitors wearing them. Aloha shirts are part of the “uniform” worn by Pearl Harbor Survivors, a cherished group of volunteers who support this iconic site by spending several hours per week signing autographs and taking photos with visitors to raise funds and awareness. The venerable Pearl Harbor Survivors share their incredible stories at the Pearl Harbor Visitor Center, which opened in 2010 after extensive renovations. With its swooping, aerodynamic roofs, bustling crowds, and striking landscape, complete with a full view of the glistening waters of Pearl Harbor, it's difficult to imagine that just over 70 years ago, this was a scene of tragic destruction, where World War II began for the United States. For the past 50 years, the USS Arizona Memorial has served as an international icon of the events of December 7, 1941 and the Pacific War that followed. Each year, nearly 1.7 million visitors enter the front gate of the Pearl Harbor Visitor Center to learn about the historic events of WWII in the Pacific Theater. 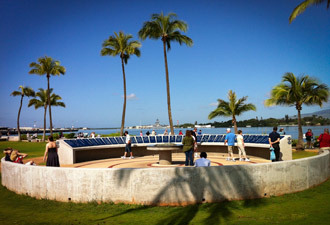 Using Recreation.gov, visitors can make advanced reservations for the free tour to the USS Arizona Memorial. While waiting for the tour to start, you can explore the grounds, which feature waterfront exhibits and two state-of-the-art galleries: Road to War and Attack. The galleries bring you closer to the sights and sounds of the events leading up to the attack on O’ahu and its aftermath. Personal memorabilia, dramatic photographs, artifacts, and video kiosks help you develop a strong sense of the events from those who experienced them. Your tour of the USS Arizona Memorial begins with a brief introduction and a 23-minute documentary that examines why Japan attacked Pearl Harbor and includes footage taken during the attack. You’re transported back in time to the 1930s and '40s, to witness the tumultuous political climate that set the stage for America's entry into WWII. Once the film concludes, active duty Navy Sailors take you to the USS Arizona Memorial by boat. As you catch a clear glimpse of the iconic white structure, it's time to pull out the camera. This is the moment that has been on the “must-see” list of nearly every visitor to O’ahu for the past five decades. Upon arrival, you may feel grief and gratitude for the lives lost. You may feel nostalgic if you or someone dear to you has distinct memories of the “date which will live in infamy.” You may even feel hopeful, focusing on how once bitter enemies made the arduous journey from engagement to peace. How you feel is up to you, as this memorial was designed to inspire reflection and quiet contemplation, providing a personal experience for each and every visitor. The lives lost on December 7, 1941 were not limited to the USS Arizona. Back at the visitor center, you will find the Remembrance Circle, containing the names of all 2,390 Americans who were killed that day. The USS Oklahoma and USS Utah memorials, located on nearby Ford Island, are also part of the national monument. Dedicated to the Sailors and Marines who lost their lives on these two warships, they are not to be missed. 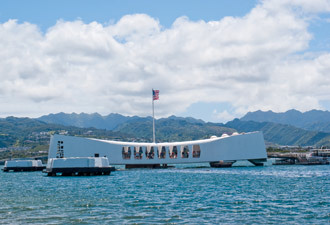 There's even more to explore beyond Pearl Harbor. 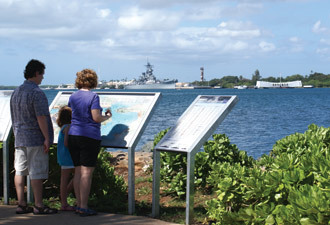 The visitor center is the portal to Pearl Harbor's other historic venues: the Battleship Missouri Memorial, the Pacific Aviation Museum, and the USS Bowfin Submarine Museum and Park. The Pacific War was not limited to Hawaii. Additional sites of World War II Valor in the Pacific National Monument on the Aleutian Islands of Kiska, Atka, and Attu are managed by U.S. Fish and Wildlife Service (FWS). One additional site preserving the history of Japanese-American internment during wartime is co-managed by the National Park Service and the FWS in Tule Lake, California. From the attack on Pearl Harbor to the Treaty of Peace with Japan in 1952 and every battle in between, this part of history must not be forgotten. It is this history, the stories behind the aloha shirts, that makes Pearl Harbor the number one visitor destination in Hawaii. Don't miss your opportunity to learn about history from those who made it. Plan your visit today!